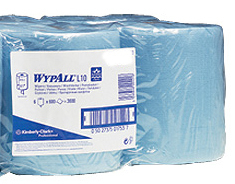 WYPALL* L10 Regular Duty Roll Control Centrefeed Wipers – an innovative roll control wiper system that helps reduce wiper consumption. Each sheet dispenses individually eliminating waste caused by streaming. Available in blue as blue has become the universal colour for disposable items in food preparation areas. Roll Control Dispenser, grey ABS plastic, lockable.